Geology got into the hands of the theoreticians who were conditioned by the social and political history of their day more than by observations in the field. We have allowed ourselves to be brain-washed into avoiding any interpretation of the past that involves extreme and what might be termed ‘catastrophic’ processes. However, it seems to me that the stratigraphical record is full of examples of processes that are far from ‘normal’ in the usual sense of the word. In particular we must conclude that sedimentation in the past has often been very rapid indeed and very spasmodic. This may be called the ‘Phenomenon of the Catastrophic Nature of the Stratigraphic Record’. A sample list of impressive past catastrophes not difficult to compile: ice-dam bursts that gouged out the English Channel in weeks or the scablands of Washington State in hours, asteroid impacts that left craters up to 300 km wide, lava flows that covered a third of India. But events on this scale do not characterise the bulk of the geological record. Less dramatic but just as interesting is the nature of the stratigraphic record between such events: the rate of the sedimentation that was once normal. Having considered the question in relation to the background sedimentation of shallow seas in the Cretaceous period, we now turn to the sediments left by tides. These forces of nature that are also not catastrophic. While coasts are continually being eroded by landslip and the pounding of waves, tides usually only re-distribute sediment, shifting it back and forth from place to place. Their work is ephemeral. 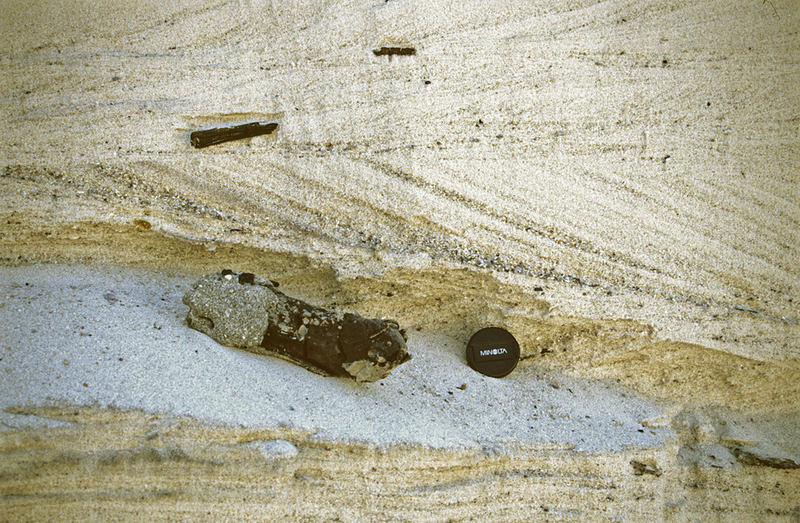 Occasionally, a change in current flow can lead to the preservation of sand bodies metres thick, but such accumulations are always susceptible to being re-eroded, by wind if not water. To create a permanent record requires rapid subsidence and burial. Tidally formed beds should therefore be rare in geology, especially those that show patterns diagnostic of 6- or 12-hour tidal periods. Based on present rates of radioactive decay, sedimentation rates in general were typically around 0.01-1 mm per year, depending on whether the regime was quiet or vigorous. Chalk was at the low end of the scale, high-energy deposits such as the Old Red Sandstone at the high end. But even where rates were rapid, six hours of sedimentation would have produced only a 0.0007 mm increase in thickness: about one hundredth the thickness of a sheet of paper. They would have left no mark on the record. A preliminary word on what causes tides. As the Moon orbits round the Earth, it passes from new moon, when it comes between the Earth and the Sun, to full moon, when the Earth comes between it and the Sun. The full cycle takes just over 29.5 days. Tides are caused by the Moon’s gravitational pull on the oceans, which bulge out where the Moon is nearest. To a lesser extent they also bulge out on the opposite side, where the Moon’s gravitational force is weakest and the oceans at their most relaxed. Since the Earth rotates about its own axis once a day, in most parts of the world there are two tidal cycles in a day. In a few places, such as the Gulf of Mexico, there is only one. Tides are strongest just after new moon, when the combination of the Moon’s and the Sun’s gravitational pull is at a maximum, and weakest just after full moon. The strongest motion is called the spring tide, when there is most ‘spring’ or bulge in the oceans. The weakest is called the neap tide. In each lunar cycle there are thus two spring tides and two neap tides. It is the distinctive combination of these rhythms that makes it possible for lunar cycles to be identified in the sedimentary record. The in-and-out rhythm of each flood and ebb over approximately 12 or 24 hours is coupled with variation from strong to weak and weak to strong over one lunar month. Tidal beds are most commonly recognised by the alternation in the slant of internal bedding. 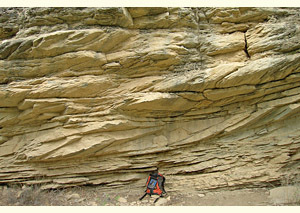 In this example from the Woburn Sands Formation, Bedfordshire, dating to the Lower Cretaceous, the bed above the burnt log records current action from left to right. Above it, and in the bed behind the lens cap, the laminae slant from right to left. Such a pattern, produced by the alternation of ebb and flood, is known as herring-bone cross-bedding. The vertical zig-zag pattern is not always regular, for in one part of a bay the current might be dominantly ebb and in another dominantly flood, making one direction more frequent than the other. High rates of sediment supply caused rapid changes in shoreface topography and current strengths frequently fluctuated. Cross-bedding is distinctive of dune development, as water-borne grains travel over the crest of the dune and come to rest on the downstream slope. Sediment accumulates mostly as a result of lateral rather than vertical accretion. Where the bedding direction switches back and forth regularly, the successive beds represent successive tides, without any time-gap. 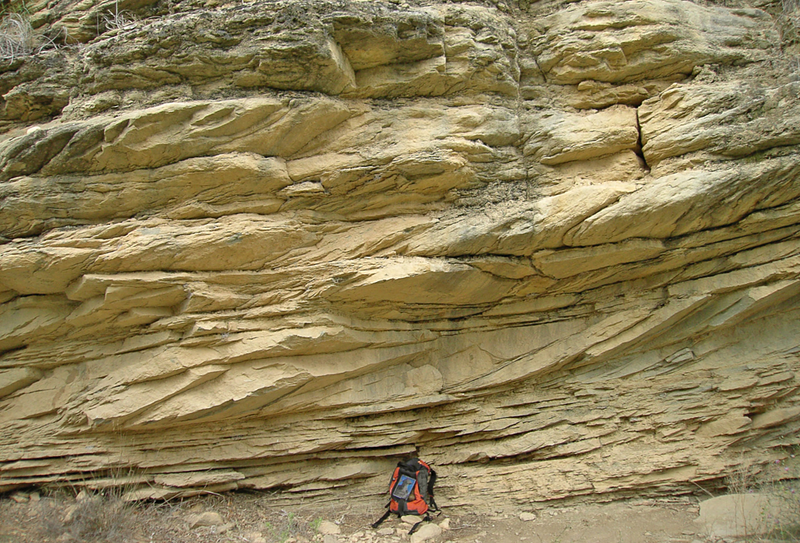 Where the beds are unidirectional or switch direction irregularly, the sediment must have built out dominantly in one direction (‘prograding’). The latter situation is more common than the former. In either case, it is clear that the sediment supply from inland was high: sufficient either to create rapidly accumulating vertical piles or to spread rapidly prograding dune-forms down into the basin. Mud drapes are also characteristic of tidal beds – thin deposits of finer material that fall out of suspension during the interval of slack water. Where only the downstream part of a dune is preserved, the slanting subdivisions are often separated by mud drapes or laminae and may show the cyclicity of a neap-spring cycle. The approximate number of bundles constituting one such cycle will be either 14 or 28, depending on whether the regime is diurnal (two tides a day) or semi-diurnal (four a day), and bundles will thicken overall as the lunar cycle passes from neap to spring. This is a different style of sedimentation from herring-bone cross-stratification, for here there is no alternation of current direction. The tidal cycle is asymmetric and dominated by currents flowing strongly in one direction. Bed-forms are characteristically ‘sigmoidal’ as sand grains tumble over the crest of the dune and bundles become thicker as the beds build out. The photograph above shows tidal bars from the province of Lleida, Spain (click here for a close-up view). The deposits are Eocene in age. Below, a diagram illustrates how the pattern of stratified sand bars accreting from right to left can be linked to the lunar cycle. Tidal rhythmites are couplets of sand-mud laminae that accrete vertically. They are the equivalent of tidal bundles and typically show lenticular, wavy bedding, often with small-scale cross-lamination. 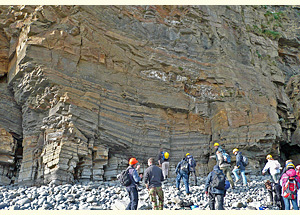 The photograph shows an example from the Carboniferous of south-west Wales. The rhythmites occur in a channel – quite a deep channel for a tidal environment – incised by a powerful outflow. The funnelling effect has increased the rate of aggradation and thereby preserved a spectacular picture of the sediment supply. 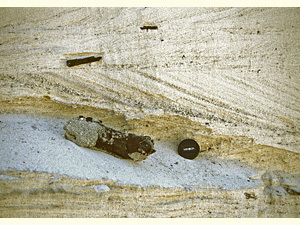 The thicker, more rippled laminae making up the lighter-coloured bands consist mostly of silty sand – coarser material that dominated when the tides were strongest. The darker bands are mostly mud, when the tides were weaker. One set of lighter plus one set of darker laminae equal one lunar month (click here for a close-up). The sedimentation rate within the channel was 3-4 metres per year, comparable with the rates of ‘several metres per year’ documented in other locations (Couëffé et al. 2004). The frequently rhythmic nature of geological sequences requires an explanation. Why is background sedimentation bedded at all? Why are stratal thicknesses so regular? What causes the alternation between marl and chalk, silt and mud? 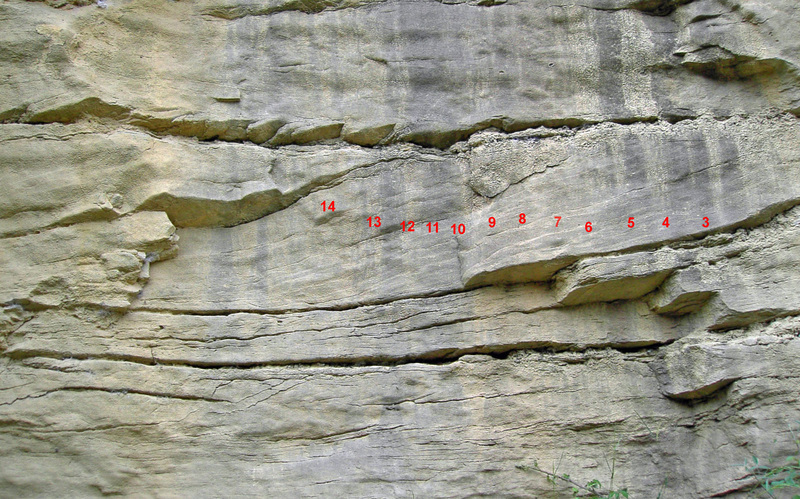 In the case of chalk successions geologists invoke astronomical cycles: either precession (the 20,000-year circuit of the Earth’s axis around the mean celestial pole) or obliquity (the pendulum-like 40,000-year variation in its axial tilt). Conceivably such cycles could have had long-term effects on climate that overrode local variability. However, although they accord with the overall framework of radioisotope chronology, the fossil and sedimentary evidence indicates much shorter periods. Geologists are having to choose between what their eyes tell them and what their interpretative framework tells them, and going with the latter. As we have seen, the chalk-marl alternations are better understood as warm-cool cycles produced by the annual cycle of summer and winter. With tidal beds there is no alternative and no debate. They are not products of 20,000- or 40,000-year cycles but of the monthly cycle. The direct evidence of the rocks themselves has to be accepted. Ager opined aphoristically that the ‘history of any one part of the earth, like the life of a soldier, consists of long periods of boredom and short periods of terror’. Sedimentation was ‘very rapid’. But it was also ‘spasmodic’, and the way to reconcile the field evidence with the isotopic timescale was to postulate that the missing time lay in invisible gaps, long boring periods when locally nothing was going on. The geological record was incomplete, 99.99% incomplete. That is a tenable view if only intrinsically catastrophic events, such as landslides, show evidence of rapid rates. Background sedimentation, such as the accumulation of sea-floor ooze or the build-up of estuarine dunes, is not catastrophic. In the geological past, rates of sedimentation were fast enough for even those environments to be made visible. Although what might be termed catastrophic processes are generally recognised for what they are, the world is still ‘brain-washed’ (Ager’s word, above) into avoiding interpretations of the past that contradict the multi-billion-year timescale. Perhaps only children can see when the emperor is without clothes. As we grow older we become more critical in many areas of life, but our ability to perceive the truths of the natural world grows dimmer.